where the wild things are no. 10. juniper pickled onions. Strangely, I have been craving juniper this past year. It started late last Summer, upstate, with a series of wild cocktails and juniper stuffed trout. I have since experimented with a number of recipes and drinks, to which my friends can attest, as I have plied them with many a juniper tipped cocktail. I had never really incorporated juniper into my cooking in the past but now, I don't think I could live without it! It should really have come as no surprise to me that I would like it this much. I do, after all, love gin, that brilliant aromatic spirit, spiced with juniper and other aromatic herbs and spices. I discovered gin in my early twenties. (Right now my two favorites are Hendricks and Breuckelen Gin.) Juniper smells both medicinal and like the darkest forest floor. It is very complex. I have many Juniper recipes to share but for now I will post my current obsession; juniper pickled onions! Once you try them, there is no turning back. After 20 minutes, heat the brine to a slow simmer. 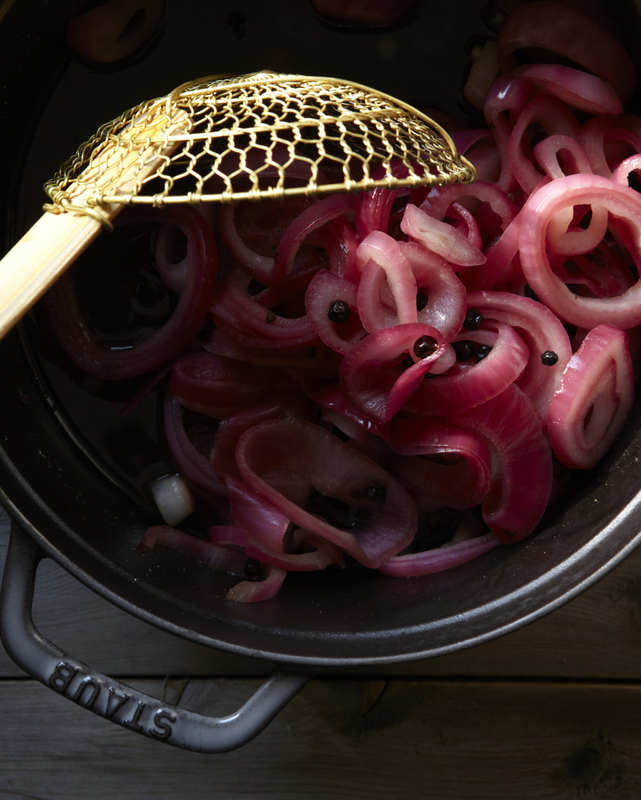 Divide the onions into thirds and drop into the brine for 20 seconds. Remove after 20 seconds with a slotted spoon and set aside. The onions will turn a brilliant pink. When all the onions have been run through the brine, turn it off an allow it to cool. When cool put the onions in a Weck or Ball jar or some other airtight storage container and pour the remaining brine over the onions. The pickled onions will last for a couple of weeks in your refrigerator.